We recognize instinctively that grandparents have a positive effect on grandchildren. An experienced caregiver with similar values and methods to your own who has nothing but the best interests of the child at heart and will brag endlessly to their friends about them; how could that not be a good thing? Now there are studies that not only back that up but also show that regular interactions can have great positive effects on the grandparents as well as the children. 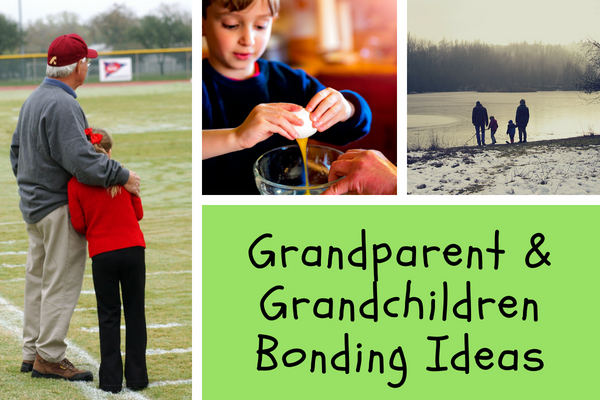 In this article I’m discussing some ideas to help grandparents and their grandkids bond and access some of those positive benefits. Before we get stuck into the ideas, let’s look at the specific benefits. Studies have shown that close grandparent - grandchild relationships can positively affect a child’s mental health, survival and nutrition and lead to fewer emotional and behavioral problems and fewer difficulties with peers. Close grandparent-child bonds lead to decreased rates of depression in the older generation. They are more likely to offset dementia, have a lower risk of developing Alzheimer's and can have a longer life. An Australian study showed better performance on cognitive tasks than those that don’t spend time with grandkids. A source of endless bragging! The result will be some nice ice cream of soft serve consistency that can be eaten straight away or put in the freezer to harden up and be eaten later. This method is ideal if you won’t have much time and you don’t have an ice cream maker. Using ice and salt is also the old method of making homemade ice cream so grandparents might have some stories to share on that. Finally, this method promotes physical exercise which is fun and healthy for all generations. The no churn method of making ice cream is relatively new and therefore perhaps represents something that grandchildren can teach their grandparent/s or that they can learn together. Here’s a video of me making Choc Cherry Ice Cream using the no churn method. With this method, five to eight hours of freezing time is required to get the ice cream ready to eat so it’s best for a day long or overnight visit. As you can see in the video, the crux of ‘no churn’ is that the air is incorporated into the ice cream by whipping the cream and then it is frozen in a separate stage in the freezer. This gives an opportunity for kids to learn some cooking skills and see how food can change structure and texture in the process. For this method you’ll need an ice cream maker (click here for my guide to the best machines). The addition of a special machine makes this method even more exciting and interesting. You’ll get ice cream at soft serve consistency with 20 - 30 mins churning and then 4 - 8 hours in the freezer will bring it to scoopable hardness. Here’s a video of me making Clotted Cream & Jam Ice Cream using a relatively low cost ice cream maker with a freezer bowl (keep in mind that this machine type requires you to pre-freeze the freezer bowl at least overnight so there’s a bit more preparation required. However, there are some more expensive machines that don’t require this step). See what special equipment or skills the grandparents have to guide what cooking projects to tackle. I remember for me growing up my grandma had a pasta making machine and one time I went over and we made pasta together and then served it to the family at dinner. Great memories. We want to make these bonding experiences regular but it won’t be very healthy if we’re cooking every time so here are some other ideas you can try. Games - games have changed a lot in the last few generations (board games -> computer games -> internet games) which means there should be lots to talk about and learn on both sides of the age gap. History - have kids interview their grandparents about their childhoods. You’ll be amazed at the questions they come up with and they’ll be amazed at the answers they get. Craft Projects - this is the non-food version of the cooking projects as there’s lots of opportunities for creativity, getting hands on and you’ll have something to show for it at the end. Photos - go through some old photos albums or slide decks together. If you can get copies of old photographs you can combine this idea with the one above and do some scrapbooking. Reading a book together - learning opportunities and the thrill of the story. Video / Phone Call - if grandparents don’t live closeby, you can allow kids to call them and have a private conversation so they still get some one on one time together. Those are just some ideas to get you going but there are plenty more. In this section I’ll give some tips to make the organisation of these bonding sessions work more effectively. In many cases these tips link back to the research backed benefits discussed at the beginning of the article. I hope those ideas have your brain buzzing about a new family tradition and future grandparent - grandchild catch-ups. Don’t forget there are benefits for both the young and old here and it can also give parents some free time to go and do their own thing or tick off some to do list items while the kids are occupied. If you have any ideas to add or stories to share, please put them in the comments below.